Brisbane, Queensland’s state capital, is a cultured delight. Cushioned by picture-perfect coastlines, it’s a sun-saturated destination with a central business district bursting with fantastic contemporary art in public places. 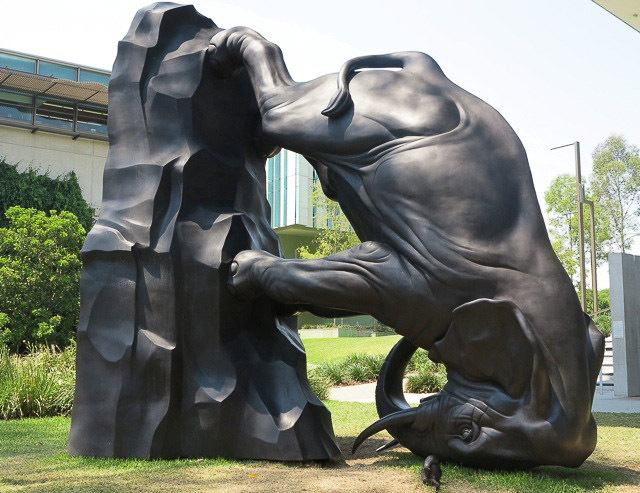 With many significant Queensland and Australian artists contributing, the public art is worth a day trip or a prolonged moment en route to the office. While some are common sights located on well-trodden thoroughfares, the best are nestled in spaces you’d be excused for missing. 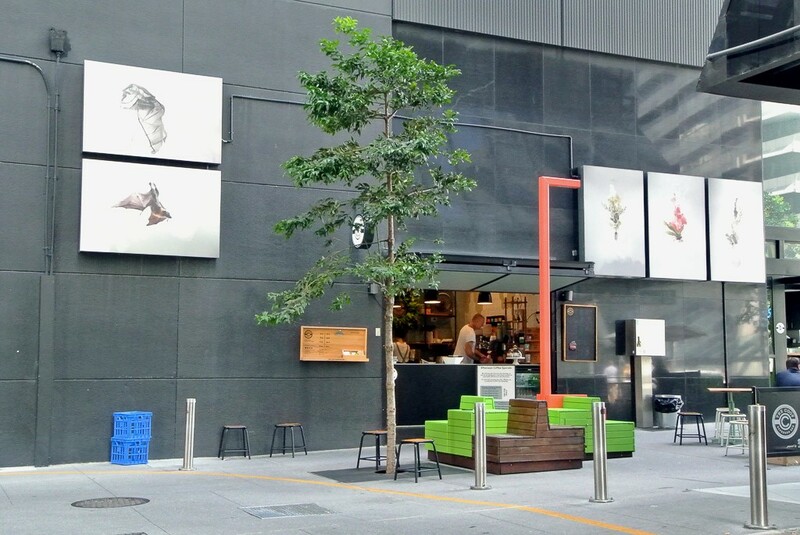 Just off Eagle Street is Eagle Lane, where you can see two photographic series by Helen Pynor and grab a great coffee while you’re at it. In these works, Pynor explores ideas of biology and the human body — dominant themes in her art practice. The Accidental Primate looks at the possible misclassification of megabats (including Australia’s grey-headed flying fox), borrowing a suggestion by an Australian scientist that they relate to primates. Milk references medicinal plant remedies of the Dharawal people, drawing on notions of biochemical synergies across living organisms. Known for glossy, varnished abstraction, Dale Frank is one of Australia’s most prolific and prestigious painters. Frank’s Charlie Cox is a sweeping mosaic wall of coloured tile. 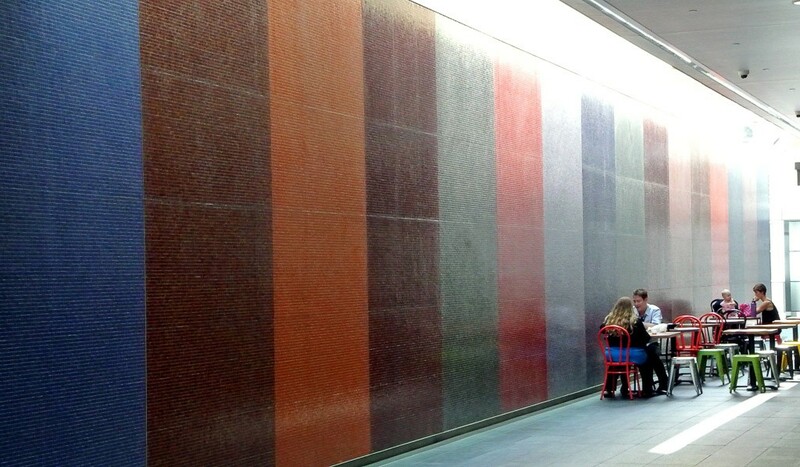 The mass of tiny tile, each glossy and uniform, contrasts with the expansive wall dimensions. As the pedestrian passes along, connecting thoroughfare sheen reveals the tile’s full-bodied colour. Of Chinese-Malaysian heritage, Pamela Mei-Leng See specialises in a contemporary form of jianzhi. Her works are characteristically handmade, of small scale, and delicate. Across the Ocean their fragrances intermingled… allows viewers to see her work in a new light. The large-scale, robust installation forms a glass ceiling over Albert Lane of Brisbane’s Queen Street Mall. Poppies, chrysanthemums, and clouds feature in the stenciled design, imagery holding symbolic meaning in traditional Chinese culture. Tropical Still Life by Jumboist imagines the interior of a 1970s Queenslander-style home. 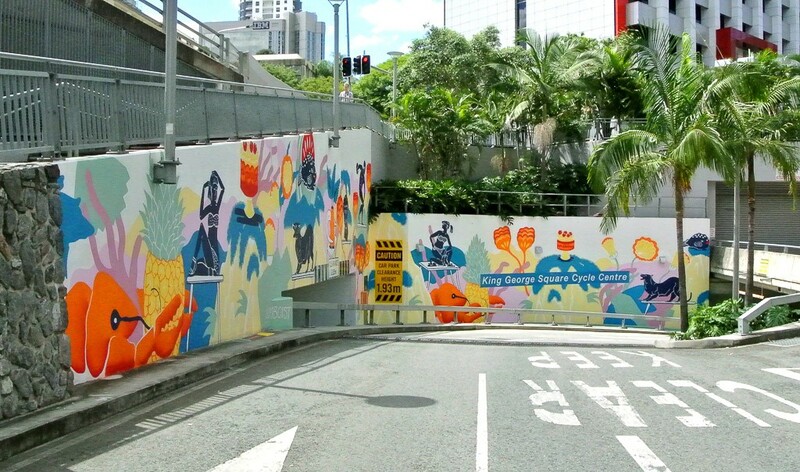 The painted mural blends modernist cues with quintessentially subtropical icons, featuring ferns, bikinis, pineapples, and crayfish. Jumboist is the alter-ego of a Sydney-based artist. His works reference modernism, low-brow comics, skateboard culture, and many points in-between. Yayoi Kusama is acknowledged as one of the most important living artists to come from Japan. Repetition and pattern are key visual tenants to her work, a continuing theme in Eyes are singing out. The large mural banking across one entire city centre block comprises black and white eyes of steel and enamel against concrete. Eyes are singing out was installed in conjunction with the construction of the new, neighbouring Queen Elizabeth II Courts of Law. Surrounding the Courts with watchful eyes, the work acts as a poignant reminder of the power and responsibility of law and justice. 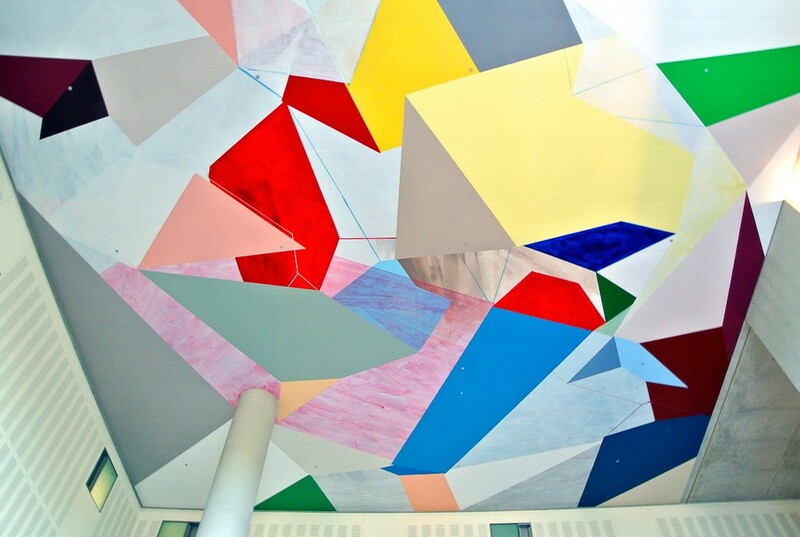 Nearby, in the foyer of the Queen Elizabeth II Courts of Law, Gemma Smith’s Collision and Improvisation (Ceiling) can be seen. The painted shapes stretch across the foyer’s 16-square-metre ceiling. Shard-like planes advance and retreat, creating and removing space as they shift between two and three dimensionality. Beginning with abstract painting, Smith’s practice explores the ability of colour to subvert the flat picture plane. The visual is distinctive of the Brisbane-based artist, whose fragmented crystalline formations span both sculpture and painting. Infiltration by Japanese-born, Brisbane-based artist Kenji Uranishi incorporates 200 hand-built porcelain blocks irregularly placed within a timber grid. 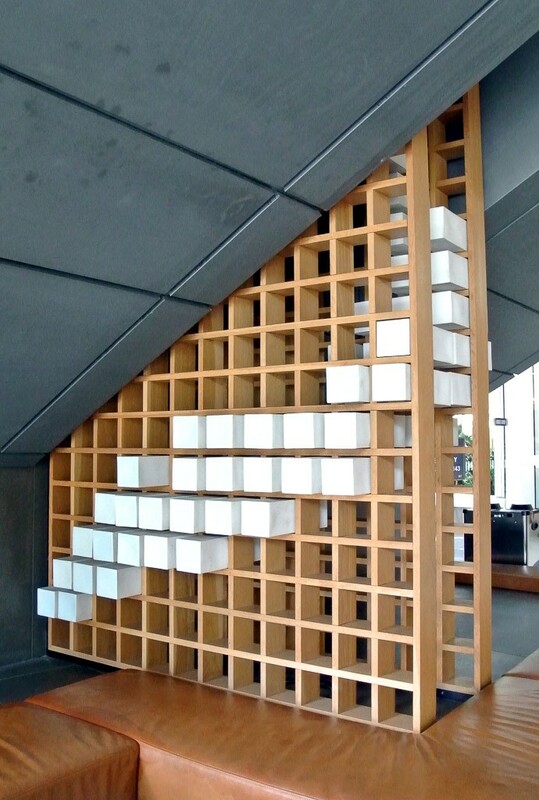 The work extends from the street into the building’s foyer in three sections, gently dividing each space. Infiltration considers the movement of water in subject and medium. Since ancient times, ceramic pipes have been used in Japan to drain and manage water, a practice referenced by the porcelain pieces projecting through the timber framework. If you’re interested, pop over to the Museum of Brisbane; Kenji Uranishi has a solo exhibition there until 22 May 2016. 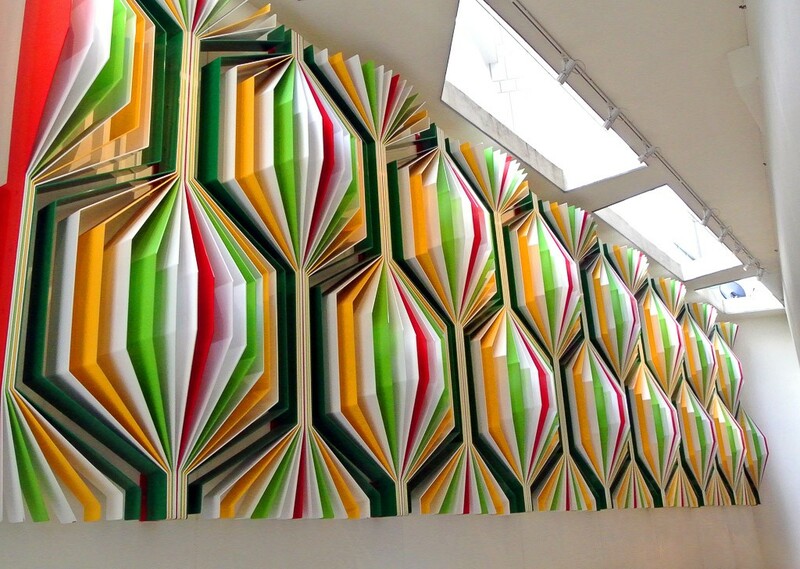 Lincoln Austin’s abstract op art sculptures combine repeated form with optical illusion. Once, Again — a large wall relief comprising powder-coated aluminum, stainless steel, and nylon — continues this theme of repetition and geometric shapes. Seen in a narrow, light-filled nave in the Santos Place Arcade, it’s an ordered, complex arrangement of line. Natural light gently, and sometimes dramatically, transforms the work, casting fractured shadows and bouncing colour. The World Turns comprises a large-scale bronze elephant and kuril — a native water rat. While the upturned elephant appears to take centre stage, the kuril plays the leading role within the artwork narrative. The elephant, tipped on its axis, indicates a world turned, whilst the kuril continues to live firmly planted on the ground. The work references the blind spots of recorded history, but as the world turns, there are many other stories significant to our understanding of history. Located on the bank of the Brisbane river and near to the Gallery of Modern Art, a visit is the ideal opportunity to visit permanent exhibitions of Indigenous Australian art and see international blockbuster shows. If you visited Brisbane with a departing international flight you’re in luck; Brisbane artist Sebastian Moody’s text-based work will see you off from the International Terminal. Intended as a farewell travel blessing, Keep the Sunshine bids travelers goodbye with friendliness, warmth, and kindness. 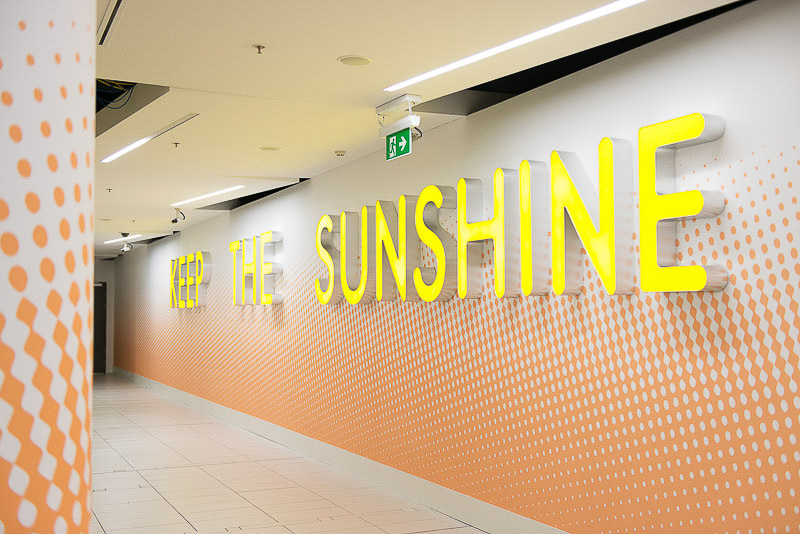 ‘Sunshine’ as a metaphor for a good life, health, and positivity encourages outgoing passengers to reflect upon what might be kept and taken with them.